Faith is a gift of God, not obtainable by human power. That is why, even if our gift of faith is very small, it can do the impossible, for if we are touched even a little by God’s power, we can be saved and transformed. 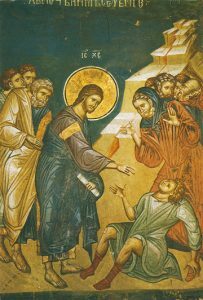 This gospel, then, continues the theme of last Sunday, it is Jesus coming to us that lifts us above our natural calling. We must be open to the gift of faith.